Someone requested a look at my studio. 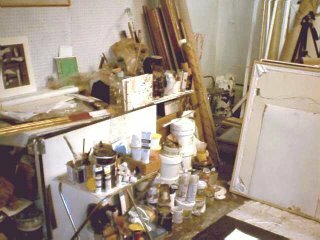 Since I started a new painting today (see the white corner in lower right of photo) I took a quick snapshot of the materials area in the studio. I will post some views of the painting as it progresses. Thanks for dropping by Renata! Hoping to have something to show of this painting later today.